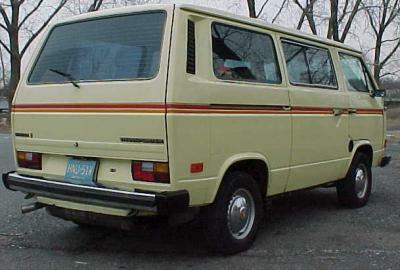 This project, now sold but fondly remembered, was a 1981 Vanagon L, with a 3.0-liter Porsche 911 six-cylinder engine, rated at 180hp. 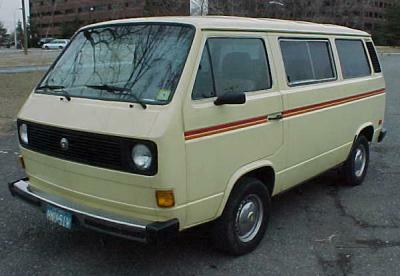 The van was a daily driver, and a great example of a fun and relatively easy conversion. 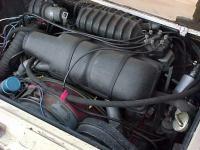 The engine was a stock 1978 911SC engine, with stainless steel heater boxes. The clutch and transmission were stock VW; the flywheel was from Kennedy Engineered Products (no relation). Tires were 205/14 Aquatreds in good shape. 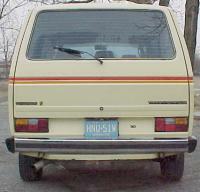 The van had an inexpensive paint job about 5 years old (was originally yellow over yellow-orange). The engine swap reduces the ground clearance a little. Some of this can be regained by raising the rear of the engine, but this would increase the size of the "hat" needed in the photo below. The headroom needed for the engine was accommodated by modifications to the engine lid, not to the body work. Body-work modifications were limited to a cutout behind the right rear wheel, for the oil tank needed for the engine's dry-sump oil system. The installation of the more powerful engine solves the only serious problem of the Vanagon -- lack of power. I retained the stock VW transmission and did not experience any clutch or transmission problems. The VW transmission is not a good choice for high-speed highway cruising. It is geared for 18mph per 1000rpm of engine speed, so 72mph is 4000 rpm, and 90mph is 5000 rpm. The Porsche engine will do this willingly, but you will stop often for fuel at those speeds. The Porsche engine pulled very well. It was purchased used so its mileage was unknown. It was fuel-injected using CIS, stock for 1978 Porsche 911. The stainless heater boxes gave it more power than the stock exhaust. An external oil cooler was mounted behind the front grill. Oil hoses ran from an external thermostat, thru the belly-pan, then up through the left wheel well to the cooler. The car had been through three different Porsche engine sizes -- 2.2, 2.7, and then 3.0. With 2.2 (about 125 hp) the oil cooler was not needed (in NJ), but with larger engines, steady cruising at 75 in summer weather seemed to require the cooler. Gauges had been added on the dash to monitor the Porsche engine. Other interior modifications included replacement of the stock brown corduroy interior with a tan interior from an 85 van. The speedometer and tach were also from that newer van. 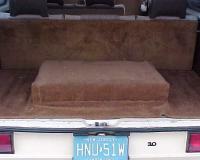 There were headrests -- dark brown 81 style -- at 2 seats in each row. Two 85-style headrests come with the car. There was an aftermarket glass sunroof over the feet of the second-seat passengers, where the driver could just reach to open or shut it. The van was not airconditioned. I sold this van because I didn't have time for it: I need to focus my garage time on a 77 Targa.